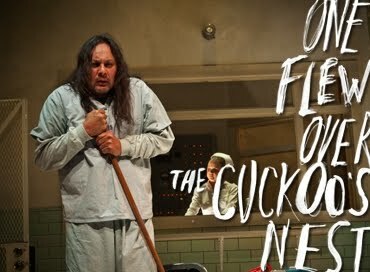 One of my most memorable evenings this winter was attending Portland Center Stage's production of One Flew Over The Cuckoo's Nest. It's hard to admit, but the memories and emotions called up for me were somewhat bewildering. After all this time I like to think that I've processed my childhood - my mother's stays in mental hospitals, the stories of her electric shock treatments, my horror at her visiting rooms, with patients every whit as colorful as Ken Kesey's characters. But to me they weren't characters. There was no laughter. This was a nightmare. Well, perhaps I'm not ever going to be done processing. And here was a chance to experience the life cycle of a mental illness once again. The performances were tremendous - I loved the textures of the characters and their problems - part and parcel of each. There were many darkly hilarious moments, as when Ruckley (Rich Cashin), the catatonic shell of a man who always stands arms outstretched, becomes a ready-made basketball hoop; or when the delightfully weird Scanlon (Ebbe Roe Smith, one of my PCS favorites) tinkers with his doomsday bomb. And yet with each belly laugh, and the laughing of the audience - I felt a small lurch of my heart. What of those who can't simply walk off a stage after the show is over? What of those who must live their lives as mental patients, their whole worlds defined by their disabilities? It's the most heartbreaking thing I know. And so mixed feelings colored the experience. I relished the many stories garnered from the wonderful Ken Kesey novel, but my favorite thread was that of Chief Bromden (played by Tim Sampson, whose father acted the role in the 1975 film). A deaf mute in everyone's estimation, the Chief would pause and think, and these thoughts were broadcast for us in "freeze frame" moments, using the actor's resonant voice. Seeing through the lens of his illness and brokenness was poignant, because there was beauty and truth in his observations, despite skewed facts. This served to remind the audience of the wisdom and validity of what a suffering patient feels. Perhaps the whole world really isn't a ferocious combine, out to crush us all - but what could be a more perfect metaphor? We watch in hope as, after years of neglect, a soul reaches out to the devastated Chief. New patient McMurphy (PJ Sosko) approaches him as one human with another. For McMurphy's gift is that unlike the "professionals" of the institution, he treats each person like a person. His respect and friendship slowly work on the Chief, until one day the man actually participates in the patient vote. I found it agonizing, and bittersweetly funny to watch the Chief slowly, ever-so-slowly, raise his hand. And yet this, too, touched me: truly I've seen my mother move at such a pace. At times it felt like years were passing before she could finish setting down a glass of water. Perhaps the greatest blessing of art is that it doesn't let us forget out past, our pain, but teaches us to honor and experience and make things out of it. To tell stories, to gain insights if we can. To laugh when it seems most inappopriate, to cry when we don't expect to. Portland Center Stage has gathered an amazing cast to bring us this story of hard realities. The mesmerizing feel of the set, with lime greens and day-glo whites, echoey sounds, and weird hi-fi quirks and rattles when the "soothing" sixties stereo music is played - this all takes us to a broken past, and we take a hard look. Thank you PCS, and Ken Kesey, for this gift. 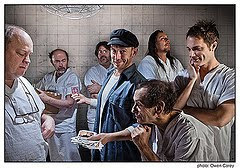 Top Photo: Chief Bromden (Tim Sampson) understands more than Nurse Ratched (Gretchen Corbett) suspects in One Flew Over the Cuckoo’s Nest by Dale Wasserman from the Ken Kesey novel and directed by Rose Riordan.